There’s a direct relationship between overall employee morale and employee job satisfaction, and surveys can help you see it. Job satisfaction surveys do make a meaningful connection between employees’ criteria for job satisfaction and an orgaanization's business goals, so that it can engage its workforce in a truly satisfying way. 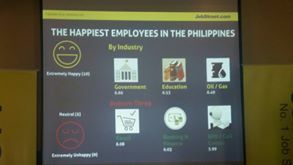 For two consecutive rows, Filipinos are the happiest workers according to the online employment portal JobStreet. 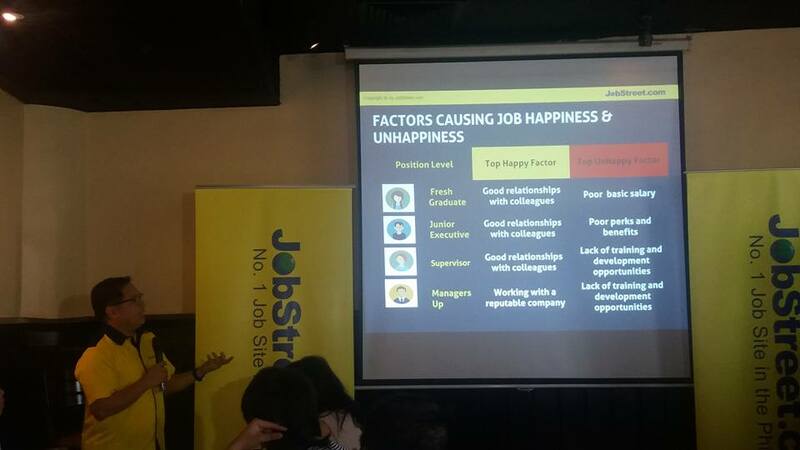 JobStreet.com’s 2016 Happiness Index Report of employees compared workers from six other Asian countries ( Hong Kong, Vietnam, Thailand, Malaysia, Singapore, and Indonesia)and Filipinos are still at the top of the ladder when it comes to being happy and satisfied at work. 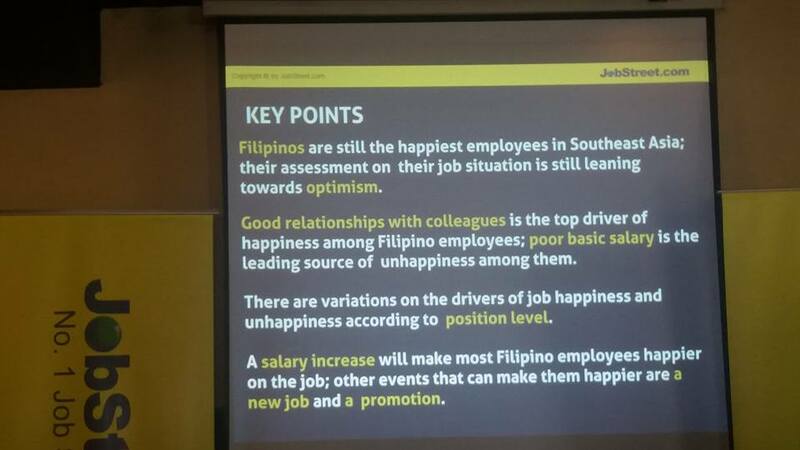 The Filipino's optimistic view makes them more competitive. 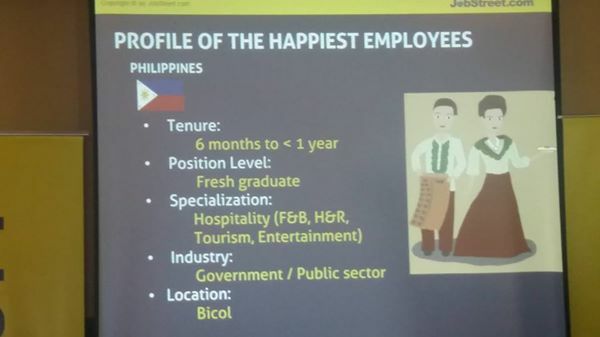 JobStreet Country Manager Philip Gioca said the continued growth of the Philippine economy after the elections was lifting the spirits of Filipino workers. The Happiness Index Report clues in companies on the top reasons that make employees stay with an organization and give clues on the programs and systems they can create to establish a better working environment. The Report also imparts to companies the job qualities or factors that affect the increase or decrease in job happiness. Respondents are a good mix of position levels ranging from fresh graduates to supervisorial and managerial positions and even top management, from all around the country, having stayed in their current jobs for varying lengths of time, and representing various specializations and industries. 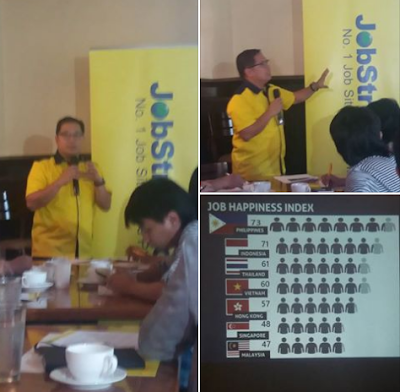 Of the 12,796 Filipino respondents, the average satisfaction rating is 6.25 on a 10-point scale. Indonesia (6.16) and Thailand (5.74) come in second and third, respectively. Singapore has the lowest satisfaction rate at with average satisfaction rating of 5.09 out of 10. The Philippines also topped the Job Happiness Index, with 73 people happy out of 100, just two points more than Indonesia at 71. Malaysia has the lowest happiness index at 41. The survey also asked respondents to predict how satisfied with their jobs will they be in six months. Indonesia topped this category at 6.58, while Singapore clocked it the lowest at 4.93. The Philippines ranked third with a rating of 6.18. The Job Happiness Index Report also enumerated the factors that make employees happy at the workplace. 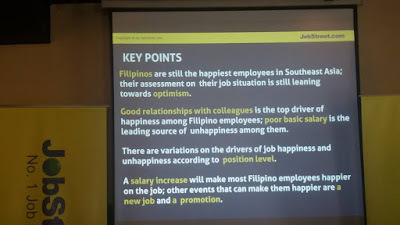 Filipinos put a high premium on great rapport with colleagues, convenient work location, and the company’s reputation. These factors can easily be attributed to the relational nature of Filipinos, the worsening traffic situation that results in unproductive hours for employees, and the need for stability in the companies they work for, respectively. Other reasons for employee happiness are salary, benefits, leadership, career development, job security, culture, corporate values, trainings, work schedule, and immediate superior. Meanwhile, the top factors that make employees leave a company are uninspiring leadership, insufficient salary, lack of benefits, and lack of trainings. As stated in Herzberg's Motivators and Hygiene Factors, these factors are not necessarily what makes employees happy should they be addressed competently, but can be hugely influential in employees’ decisions to stay or find better opportunities. 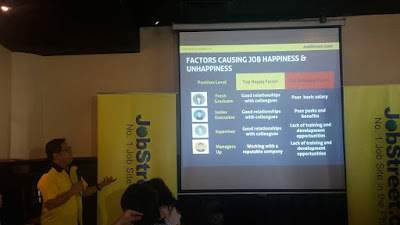 To increase job happiness, Filipino respondents recommend desire a higher salary (34 percent), followed by getting a new job (21 percent), and getting a promotion (8 percent). 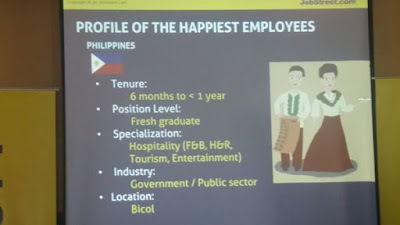 Among the Filipino respondents, the most satisfied are those who have been in their current jobs for six months to a year, working in the education, gas and oil, and government sectors; specializing in hospitality (food and beverage, hotel and restaurant), building and construction, and education; and located in Bicol, CARAGA, and Western Visayas regions. JobStreet.com is Asia’s leading job marketplace. Located in five countries, the site is also part of SEEK Limited, the world’s largest network of job marketplaces by market capitalization. It currently services over 230,000 corporate hirers and over 15 million jobseekers in its database.